Strange but true – Why Singapore’s ‘vlog tax’ will actually benefit influencers and creatives! Some members of Singapore’s blogging community have expressed surprise at a letter they have received from the Inland Revenue Authority of Singapore (IRAS) clarifying income components - including products or services received via their websites - which need to be declared as part of their annual Income Tax Return. 938LIVE has seen pictures of the letter in question. The memo states that all non-monetary benefits, including sponsorship of products or services received in return for writing or reviewing the sponsors’ products “may be taxable and must be declared”. From Vulcan Post’s point of view, these taxes will affect those who blog as a business, with those who blog as a hobby hopefully exempt. Further information is available in a fact sheet on the IRAS website. Many bloggers have expressed confusion at the letters and rightly questioned the practicalities of declaring receipt of a lipstick for instance. Others have taken it even further declaring this could spell the ‘death’ of the industry. This is probably going to shock you, but we at SushiVid are actually in support of the new taxes, at least the taxing of monetary interests. Well for a number of reasons, but chiefly because they push the markets towards transparency. Think about it this way, if we continue to linger in the dark, lacking transparency and data, we will never be able to grow as an industry. For instance, in establishing SushiVid, we have found it extremely difficult to find any information about influencers; be it in their pricing or ways to standardise work ethics. We’re realised there is a real need for data that can impart legitimacy within our industry. Imagine a company has refused to pay you. Which authority could you approach for help? And without having paid taxes, would that authority be willing to help? Would they in fact be able to help you when they lack no tangible data, guidelines or agreements as you’ve been working under the radar? Even if you had signed a contract, what is the baseline or reference point for the agency to work with? Additionally, this would be a way to discover whether agencies have been staying true to their agreements not to take a cut of your fees. Yes, agencies say they don’t take anything, but is that real? In our experience some blogger prices are pushed up by agencies. However, with the taxes, agencies will find it harder to push up these prices without transferring the taxes to the creator. For example, say you as the creator agree to work for SGD 5,000, but the agency charges the brand SGD 10,000 on top of their usual 15% consultation/management fee. Previously creators would have been blissfully unaware, but now, with the taxes, this information will be readily available. Additionally, if bloggers are taxed, agencies will be too. And if we had to choose between giving the money to the government (well, the Singaporean government anyway) or giving it to agencies, we’d choose the former. It may not be very rock n roll to heap praise on governments, but if you think about it, most governments do provide grants to help creators. Over the years they have even provided learning centres, permanent residence, study grants and subsidies to lure foreigners with creative skills to the industry, thus spurring growth in the local sector. The Media Development Authority (MDA) have funded grants for the industry, hosting competitions for songwriters where they can make music for MediaCorp TV shows. These are the little things that often go unseen and unappreciated. With more taxes, there should be more opportunities for the arts to flourish. Let’s be honest, if we are in the fortunate position of earning a living from our creative pursuits, it is in the spirit of the community to channel some of that money back into helping the community grow. Otherwise, we’ll be hoping for charities and philanthropists to keep us going. On a side note, Singaporean YouTubers will really benefit from using SushiVid! Our systems provide influencers with an amazing billing system, which spares you the hassle of waiting for physical invoices. Instead, you can just log in to SushiVid and print out your statement for the year for your income taxes. Receiving a letter from the IRAS is always a little discomforting. 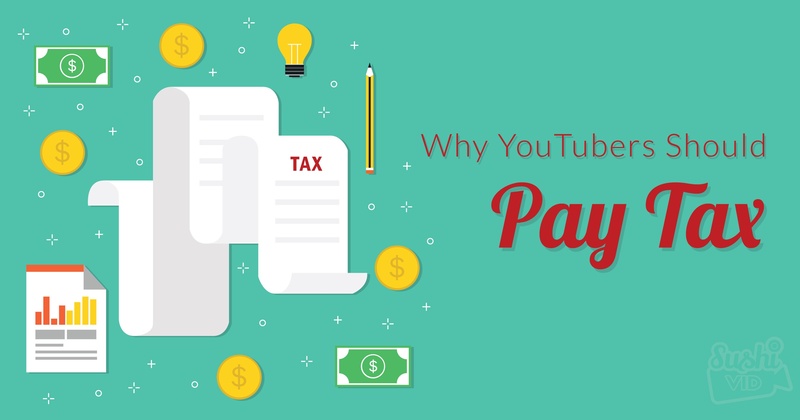 However, in essence, these taxes could help to promote the YouTube ecosystem in just the same way that we at SushiVid are trying to do. Still not convinced? Perhaps a comparison with the Malaysian situation will change your mind. Here in Malaysia the KLPAC has hired art directors and creators who practice month in, month out, in exchange for one week’s live performance and a small stipend in exchange. These people are literally suffering for their art. Imagine then if we could collect taxes and funnel those back into the industry, thus allowing it to grow and prosper. If you liked this article, do check out our article on how to charge brands for influencer videos.